American Heating Technologies Inc. is a US manufacturer of specialty products for commercial and residential customers that are sold under several brands, one of which is Luxor. As the brand name suggests, Luxor offers luxury outdoor cooking products such as charcoal and gas grills as well as accessories for people who want to barbecue in style. Though not as well-known as Weber, there are a few Luxor grills you might want to check out. 3/8″ diameter solid stainless steel rod cooking grills that are easy to clean, holds heat well, are resistant to rust, and will last a lifetime. The Luxor Charcoal 30 is a very big investment. It’s built well and definitely looks stylish with its polished edges. If you’re thinking about creating an outdoor chef’s paradise with a large, stylish grill that can beautifully cook burgers and steaks for you and your family and friends AND money is no object, then this one should definitely be your top choice. Like its portable brother (or sister), this charcoal grill is made out of 304 grade stainless steel with 490 square inches of cooking space. The grill also comes with a crank lift for raising and lowering the charcoal pan, an access door that allows you to add coal easily while cooking, a removable ash pan, and a stainless steel warming rack. Now, don’t go thinking that this one’s pretty cheap compared to the portable one because it’s not. Don’t forget, with a built-in grill, you’ll also need to shell out money for the BBQ island where your new grill will go. And you don’t get the storage space that a portable offers. You’ll have to build one yourself. Aside from being able to cook beautifully, the great thing about this grill is that it can “blend” in any kind of outdoor kitchen, giving it a more luxurious polish than other built-in grills in the market today. If you think charcoal is messy and just don’t like going through the trouble of lighting up the grill, then you might want to take a peek at this particular gas grill. For just a couple of hundred dollars more, you’ll get a lot of the same features plus a few extras. pyramid-shaped ceramic briquettes placed on heavy-duty stainless steel plates to help even distribution of heat and absorb as well as burn off drippings from food which enhances flavor. This Luxor gas grill is available in natural gas or liquid propane so you can opt for whichever fuel type is more convenient for you. And if you’re worried about using a gas grill because you’ve never handled one, don’t. This one is pretty easy to use – just push the ignitor, reach your target temp, and throw in your food. There’s nothing too technical about this stylish grill. It performs pretty well and enhances the overall look of your outdoor kitchen. What more could you ask for? In the same way as the charcoal one, this built-in is a lot cheaper than the portable gas grill. 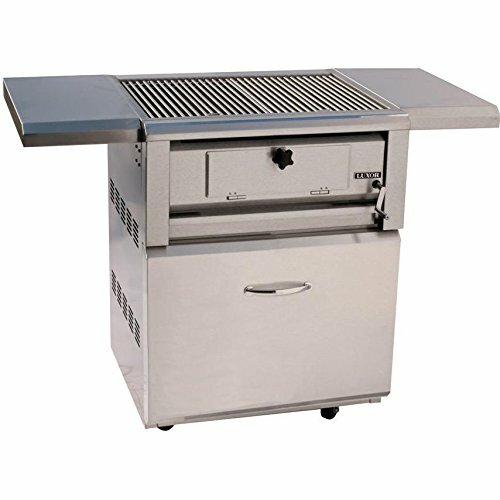 And like its counterpart, this particular grill also has most of the same features: smoker box, 409 square inch grilling area, 304 grade stainless steel housing, spring-assisted hood for easy lifting, a stainless steel warming rack, and 2 conventional burners. 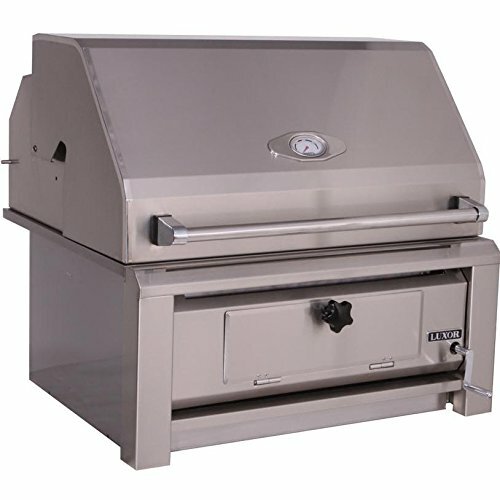 Unlike the built-in charcoal grill or any of the other portables, this particular gas grill has a rotisserie motor with a halogen lamp and infrared back burner. This means that with this built-in gas grill, you can choose to roast your food to your heart’s delight. Outdoor chefs have a new, improved way of grilling food – with an infrared burner. Infrared burners are making waves in the BBQ community because they heat up faster, reach a higher cooking temperature than convection burners, and uses up less energy and gas when cooking. Another benefit to an infrared burner is that the food turns out juicier and more flavorful. You get restaurant quality grilled meals (perfectly seared steaks, for example) at half the time it would require using a convection burner. Infrared burners are also self-cleaning. And because there is no need for a heat distributing shield, there are no flare-ups from dripping grease. Lastly, infrared burners allow you to cook in any weather enabling you to enjoy all-year-round barbecues. If infrared burners are so great, why does this grill still have 2 convection burners? Because this hybrid infrared gas grill gives you all the benefits of an infrared grill and a traditional gas grill. Infrared burners have a bit of a learning curve. It’s quite easy to burn your food if you aren’t watching carefully because the burner can reach a very high temperature. Infrared burners are also usually incapable of cooking food that requrie lower temperatures such as fish and veggies. With a hybrid grill, you can opt to cook delicate meat on your convection burners while your steak is getting seared on the infrared burner. This gives you more flexibility while cooking. Like the two grills previously mentioned, this Luxor 42″ Gas Grill on Cart has the same stainless steel housing, cooking grid, the smoker box, the spring-assisted hood, the warming rack, the shelves, the portable cart, the drawers and cabinet, etc. The main differences are the cooking area (701 square inch main grilling area that can fit 24 burgers at a time) and the infrared burner. This grill is also available in liquid propane and natural gas. Is this grill any good then? Yes, it is. You can definitely get a deliciously grilled meal out of it every time. It’s just going to cost you A LOT. But that’s the price you pay for performance as well as style. If you’re creating an outdoor kitchen with its own BBQ island, you might want to consider buying a built-in model rather than a portable one. Luxor also offers this type of grill in both charcoal and gas. If you’re going to go all out with your outdoor kitchen, you might as well go with a top quality grill built to last and stylish to boot. 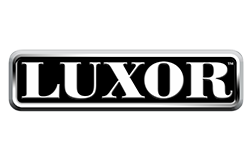 A Luxor grill may cost a lot of money but it gets the job done with a minimum of fuss and a lifetime warranty. If you’ve got the money for it, you definitely won’t regret it.